Stephen started his restaurant career in Fine Dining Italian in Oshawa at the young age of 14 as a dishwasher. 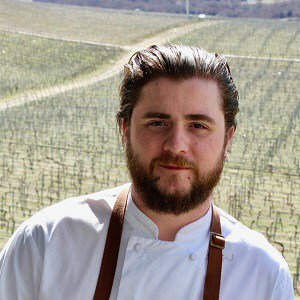 He soon discovered that cooking was his passion and he moved quickly from dishwasher to garde manger and then to running the main line before he was 16 years old. He continued to work in the greater Toronto area until he was 18, when he enrolled at George Brown College in Culinary Management. After graduation he cooked on cruise ships in the Mediterranean, where he was exposed to all types of cuisines from Scandinavian to Italian and everything in between. Upon his return to Toronto he joined an upscale catering company overseeing and executing high end events. After leaving Toronto he moved to Vancouver and joined The Irish Heather Gastro Pub and later Campagnolo Roma, where he embraced the opportunity of dealing directly with the farmers and producers in the area. As Restaurant Chef at the Sonora Room since 2017, Stephen brings that passion for farm-to-table cuisine and his amazing creative talents to offer a most memorable dining experience to Wine Country visitors.